In the midst of his mother’s sudden passing in 2002, Mark McCormack found his new career. Conversations with her financial advisor as he settled her estate confirmed for him that he wanted to become a Certified Financial Planner. His shift from a mutual fund accounting position for a Boston firm to financial planner meant he could deepen his customer relationships beyond recording transactions. He could ask probing questions about their future hopes and existing goals. He spent more than 10 years growing his business with dedicated customer service. By 2014, however, he wanted greater independence and a broader suite of products and technology options for his clients. After much consternation and research, Mark found what he wanted with Voya Financial Advisors. 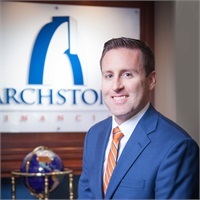 Together with four other partners, he founded Archstone Financial on May 1, 2015. In his free time, Mark seeks out ski slopes as soon as temperatures drop. He plays in multiple adult soccer leagues and coaches his son’s team. Residents of Grafton, he and his wife enjoy supplementing their children’s education with many trips to cultural attractions around New England and beyond, but they have a special fondness for Martha’s Vineyard.